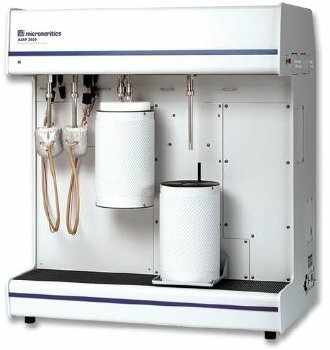 Micromeritics Limited, United Kingdom, recently donated an ASAP 2050 Xtended Pressure Sorption Analyzer to the School of Chemistry at the University of Manchester. With a long tradition of excellence in research, the University of Manchester is the largest single-site university in Britain. The School of Chemistry is one of the largest schools of chemistry in Europe, with a wide range of facilities and a broad portfolio of research expertise. According to Prof. Peter Budd, Principal Investigator, "The University of Manchester has wide ranging activity in the field of nanoporous materials, with the Centre for Nanoporous Materials (CNM) focused on metal-organic framework, zeolite, and mesoporous material research. The Organic Materials Innovation Centre (OMIC) provides a base for the development of novel polymeric nanoporous materials. The concept of "polymers of intrinsic microporosity" (PIMs) represents a growth area that is finding potential applications of great societal significance, including membrane separations, sensors, carbon capture and hydrogen storage. There is a particular need to add extended pressure capability to our sorption methods. The ASAP 2050 will benefit a network of collaborations involving the School of Chemistry at Manchester, the School of Chemical Engineering and Analytical Science at Manchester and the School of Chemistry at Cardiff University." In business since 1962, Micromeritics manufactures a broad line of automated laboratory instruments that measure physical characteristics of powders and solids for fundamental research, product development, quality assurance and control, production, and process control applications. Measurements obtained include particle size, particle shape, surface area, pore volume, pore size and pore size distribution, material density, catalytic activity, and temperature-programmed reactions. Micromeritics markets an auxiliary selection of materials characterization instruments under its Particulate Systems Division. Micromeritics also operates Micromeritics Analytical Services and Micromeritics Pharmaceutical Services, both providing contract sample analyses and consulting services.